Fade The Gap - What Does It Mean? What is Fading the Gap? First off, before we explain what "fading the gap" means, we need to make sure that you understand what a "gap" is. A "gap" is when a stock opens higher or lower compared to its close the day before. So if a stock closes at $40.25 on Thursday, and then opens up at $41.25 on Friday morning, the stock is said to have "gapped up". Reversely, if a stock opens up at $39.00 on Friday after closing at $40.25 the day before, then the stock is said to have "gapped down". 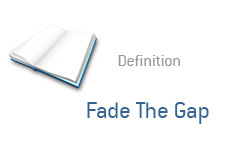 "Fading the gap" is when a trader moves in the opposite direction of a gap - meaning, the trader would buy shares in a company if a stock gapped down, or would short shares if a stock gapped up. Example: MSFT closes at $25.45 on Thursday afternoon, and is set to announce Q3 earnings after the bell. Earnings are great, and the stock "gaps up" to $27.10 on Friday morning (meaning, it opened at $27.10 after closing at $25.45 the day before). A savvy trader believes that there were many negative points about the earnings report that analysts and investors ignored, so he "fades the gap" and shorts 1,000 shares of MSFT at $27.05. He believes that the "gap up" will be short-lived, and that his short position in MSFT will soon become profitable. Example II: XYZ is rocked by the news that the company's well-respected CEO is leaving the company. The stock, which closed at $77.50 the day before, is set to open at $69.00. The stock is "gapping down" on the news. A savvy investor that closely follows the company intends to "fade the gap" and buy a position in the company at $69.00. He believes that the company's fundamentals are still very sound, and that the stock market is over-reacting to this news.